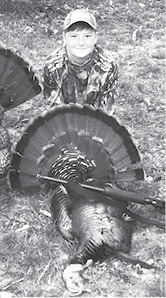 Clinton County News	» Keaton McIver is shown with his first bird of the season. Keaton McIver is shown with his first bird of the season. The turkey weighed 22 pounds and had a 10 inch beard and one inch spur. McIver killed the bird while hunting with his dad, Charles, and cousin Nicholas Matthews. He is the son of Charles and Angela McIver.